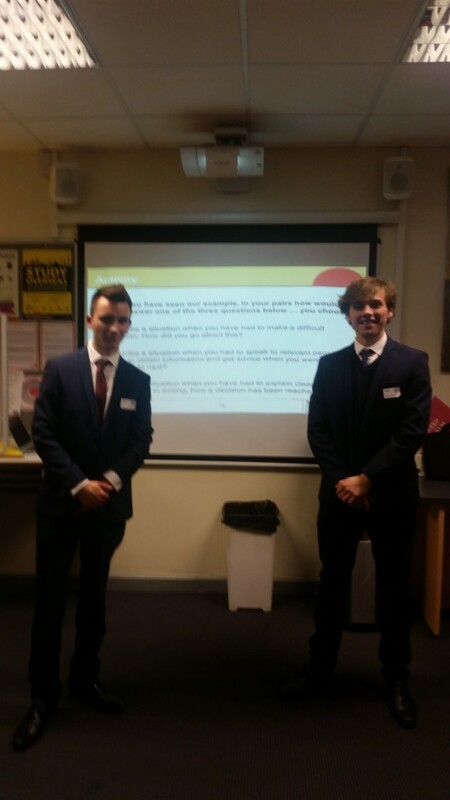 Sean Nolan and Max Dixon, both on the Civil Service Fast Track Apprenticeship Scheme presented to 100 sixth form students at Winchmore School in north London about the different ways to apply for roles in the Civil Service. The main focus was to talk about how to apply for and the benefits of becoming an apprentice in the Civil Service and they also talked about the Fast Stream, a talent management programme for graduates interested in becoming future leaders of the Civil Service. For students who wanted to apply for jobs in the Civil Service without becoming a Fast Track Apprentice or Fast Streamer, I did a live demonstration of the Civil Service Jobsite to give the students an overview of the different government departments,the amount of different types of jobs available and how to navigate around the jobsite. Sean and Max first talked about what is an apprenticeship and explained to the students that this was a good way to trained, get a recognised qualification and earn a wage at the same time. They then talked about why they both decided to apply for the Fast Track Apprenticeship Scheme and what they had to do to get through the application process from their own personal experience. The next stage was to provide an overview about the Civil Service and the different types of professions that are available to the students. Max talked about his job in HMRC working with tax credits and Sean talked about his job working in the Cabinet Office looking at ways of making savings across government. I spoke about my previous job as a Jobcentre Advisor and then my role in Civil Service Local and it was a great opportunity for the students to hear about different roles by people who do the job on a day to day basis. Sean and Max gave examples of civil servants who started their career as an apprentice and have worked their way up the career ladder giving a positive message to the students that with the right attitude you can achieve your goals. The next stages covered was how to write competencies for the applications and then an overview on the Fast Stream programme for students wishing to join the Civil Service after graduating from University. Finally, I covered a live demonstration of the Civil Service Jobsite where the students can look for jobs in the Civil Service. On Wednesday 3rd December, I had the opportunity to deliver a presentation to a group of sixth formers from Winchmore School to discuss the Civil Service and the different avenues that can be pursued when considering a career in the Civil Service. Working alongside Max Dixon and Donna Donaghey both from HMRC, we were hoping to demonstrate what the Civil Service actually do and give some useful insight into the different examples of profession within the Civil Service. The day was used as a chance to promote the Civil Service Fast Track Apprenticeship Scheme; a scheme that both Max and myself are currently participating on. The Civil Service Fast Track Apprenticeship Scheme has been set up to attract the best and most talented school leavers, offering them the chance to kick-start their career within government, as a real alternative to university. The presentation was an effective way to engage with students to see how much they actually knew about the Civil Service, and the work it does as well as to see how many of the sixth formers were not considering university and were considering looking at apprenticeships for further education. The presentation was also used to provide a snapshot of the Civil Service Fast Stream a talent management programme for graduates who have the potential to become leaders of the Civil Service. Donna also had the opportunity to explain about the Jobs Portal and how you can apply for jobs within the civil service. During our presentation both Max and myself spoke about our experiences in our job roles and the type of activities our jobs consist of. We both spoke about why we chose to do an apprenticeship instead of other alternatives and why we wanted to apply specifically for the Civil Service Fast Track Apprenticeship Scheme. This was a good activity to help the students understand a little more about government life and the demands of a Civil Service Apprenticeship. The presentation provided background information on the Civil Service and the wide range of departments apprentices could become involved in, and was used as general insight into the different areas of the Civil Service and how there are a whole different variety of job roles you can get involved in. We used a couple of competency exercises to interact with the students, so they could get a feeling for the application process for the scheme and it was interesting to hear the students approaches to these questions. We explained what an apprenticeship could provide you with that university doesn’t necessarily fulfil and some of the incentives of an apprenticeship clearly made an impression on some of the students. We discussed how an apprenticeship allows you to earn while you learn with the Civil Service Apprenticeship having a minimum salary of £20,239. We discussed how the students would be working towards a Level 4 Higher Apprenticeship Qualification and how they would be working for the public, carrying out high profile work and the experience the apprenticeship would provide – invaluable when considering university. It was a great way of demonstrating to the students how the scheme provides career development and how on successful completion of the scheme each apprentice would be guaranteed a full time job within the Civil Service and would have the opportunity to apply for the graduate scheme. The opportunity to go into Winchmore School and explain a little about the apprenticeship scheme was an invaluable experience for me and despite all the nerves beforehand; it was a great way to help young students see all the different alternatives they have available once they leave school. I think it was fantastic to see what the students know about the Civil Service and to hear some of the things the students are hoping to do. Obviously having been in their situation quite recently helped me relate to the choices they all have ahead of them about their future careers and I hope the presentation we provided was a great opportunity for the students to understand they have lots of options available to them and there are many paths they can go down in order to get to their objectives. If the presentation proved beneficial to at least one person, I think it would be a huge success and I hope the students got as much out of it as I did. On Wednesday 3rd December I took the opportunity to deliver a talk alongside Sean Nolan to Sixth formers at Winchmore high school about entry routes in to the civil service. Since Sean and I are both on the fast track Apprenticeship scheme we started by explaining that the scheme aimed to provide talented school leavers with a real alternative to university whilst allowing them to start a career and gather valuable working experience. We designed the presentation around the apprenticeship scheme which would allow us to share the experience’s we’ve had from the civil service on the scheme outlining the benefits and the areas we’ve struggled to adapt to. Alongside this we also covered the Fast Stream programme explaining how fast paced it is and how it’s designed to produce future leaders of the civil service. Towards the end of the presentation Donna Donaghey, from Civil Service Local provided the students with an in depth demonstration on how to apply for jobs via the civil service jobs portal. Sean opened the presentation by asking the students to raise their hands if they were interested in an apprenticeship and I have to be honest when no one raised their hand I thought we had our work cut out. However we soon got in to the swing of things and explained that even if they weren’t sure as to what they intended to do once they had left school, the process of applying would be extremely valuable in providing experience of completing application forms. As we were both conscious that we didn’t want the students become bored whilst listening to our talk we designed a couple of exercises to get them involved based around completing the competencies aspect of the application, which provided them with some insight as to how Sean and I completed our competencies. Following on from this we both explained our reasons for wanting to join the civil service on the Fast Track Apprenticeship scheme instead of choosing alternative options that were available. Throughout the presentation I felt as though the students were interested in the experiences we’ve had as apprentices and especially when we explained our job roles. As Sean works in the cabinet Office and I work for HMRC it showed how even though we were both on the same scheme we both have extremely different jobs and how the scheme has been designed with different pathways to allow us to both complete the programme to the highest standard without being hindered by the job we do. This was a good example of just how diverse the civil service is, meaning that there are a large amount of opportunities and avenues to be taken as a civil servant as long as you are prepared to work hard. I found the opportunity to go to Winchmore High school and talk about the apprenticeship scheme very rewarding, even if I was extremely apprehensive beforehand. It firstly provided me with experience of talking formally to a large group of people as well providing me with an opportunity to sell the scheme to potential applicants allowing me to give something back to the scheme. If you would like to get involved in making a difference to students in schools by volunteering, please email me.